Here are a few more pictures of the new Kid. I took these last week, but haven't had the time or energy to post until today. Each time I have to relearn how to do it (I was never a great memorizer), and the logic of how to upload pictures from camera to photo-shop to blogspot hasn't quite sunk in yet either! Cohen at nearly four months of age loves to stand. He has been able to support his weight on his legs for some time now. 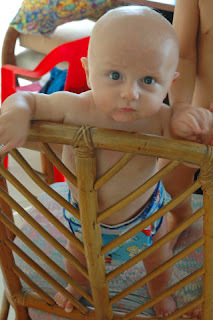 Jamie says he thinks Cohen will go from lying to walking, skipping rolling (he hasn’t repeated that since we tried the videos), sitting, and crawling! 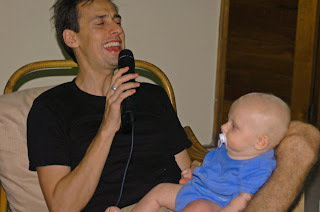 Last weekend we had an evening of Karaoke at our apartment. One of the female American teachers brought a microphone to Colombia that plugs into the TV and has a large array of popular songs programmed into it (the words appear on TV). After you sing, the machine even rates how well you did. I scored from as low as 55% to 98% (it really helps if you actually know the words). 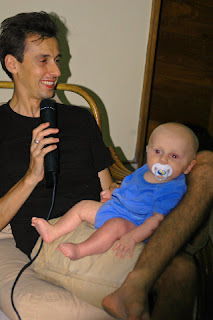 Jamie scored as low as 12% with “Summer of 69” by Brian Adams (it was picked for him – he hates Brian Adams), but redeemed himself with “I Will Survive.” The following picture shows Cohen just hanging out with dad during the event. Jamie liked this picture a lot more than the one above. Both he and Cohen look better, but the one above is funnier. Posted by Karla at 7:06 p.m.